Corinna Holt Richter, president and chief administrative officer of HOLT CAT, will be the Forum on Entrepreneurship Breakfast Series keynote speaker Thursday, Feb. 21. The breakfast discussion, titled “A legacy of innovation, values and growth,” will be held at the Pearl Stable of the Historic Pearl Brewery. The Meadows Center for Entrepreneurial Studies at St. Mary’s University hosts the ongoing breakfast series. Registration, networking and breakfast at the Pearl Stable begin at 7 a.m., followed by the program at 8 a.m. Established in 1933, HOLT CAT is the authorized Caterpillar® heavy equipment and engine dealer for much of Texas. 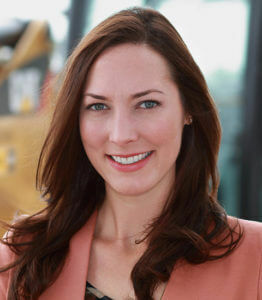 Richter leads the administrative and support divisions at HOLT CAT, including human resources, safety and environmental, information technology, organizational development, facilities management, continuous improvement, legal, marketing and strategy. She is the great-great-granddaughter of Benjamin Holt, who introduced the first practical track-type tractor in 1904, which he named the Caterpillar®. She represents the fifth generation of the Holt family business, and her brother, Peter John Holt, is the CEO and general manager. The series’ 2018-2019 title sponsor is PwC. For information on sponsorship opportunities and purchasing tables and individual tickets, please contact Pamela Luna at forumbreakfast@stmarytx.edu or 210-436-3124.